Anna Shepherd, the chairwoman of the Nashville school board, wrote an editorial in today’s Tennessean asking the State Board of Education to reject Rocketship’s appeal to the state. I don’t want to discuss Rocketship in this post, but I do want to talk about her inaccuracies about the State Board of Education. The nine members of State Board of Education are appointed by the Governor, approved by the General Assembly, and serve five year terms. Each member represents their congressional district. Nashville is part of the 5th congressional district (Jim Cooper’s seat). Gov. Bill Haslam appoints members to the state board. The only state board member who nominally represents Nashville is Wendy Tucker, co-CEO of Project Renaissance, a nonprofit organization dedicated to increasing the number of charter schools in Tennessee. Except that’s not the case. Wendy Tucker represents the 7th congressional district (Marsha Blackburn’s seat), which does not include Davidson County or Metro Nashville Public Schools. She’s not Nashville’s representative on the board. It’s right there on the state’s website if you google it. Shepherd goes on to say that no board members live in Nashville. Hopefully, the appointed members of the state board — none of whom live in Nashville — will see through Rocketship’s ruse and uphold the judgment of the local elected school board. Again, not the case. Carolyn Pearre, the Vice Chair of the State Board of Education who is currently serving her 14th year on board, lives in Nashville, TN (according to the Tennessee Education Association) and represents the 5th congressional district. Maybe it’s time for our school board to actually meet Nashville’s representative on the State Board. She’s only been there 14 years. As chair of the Nashville school board, you need to know who actually represents you at the state level. Blame the state board for a lot of things, but don’t blame them for not representing Nashville because you didn’t look it up. Diane Ravitch Calls for the Termination of Shawn Joseph’s Contract. Do others agree? Diane Ravitch, the former Assistant Secretary of Education and education historian, believes that the Nashville School Board should terminate the contract of Dr. Shawn Joseph just three months into his tenure. If you need a refresher, Diane Ravitch is an anti-reformer who teaches at New York University. Although never being a K-12 teacher herself, she is a hero to many teachers around the country because of her anti-testing, anti-accountably, and anti-charter school stances. If the elected board can’t straighten out this mess and revise Dr. Joseph’s contract to assure that he works for the board–the board does not work for him–then it’s time to cut their losses and terminate his contract. Don’t accept excuses for his wasteful spending, his ill-advised hires, his importing of the same aides involved in the scandal in Prince George’s County. If he won’t comply, say goodbye. It’s imperative to admit it when you have made a mistake. Cut your losses sooner rather than later. 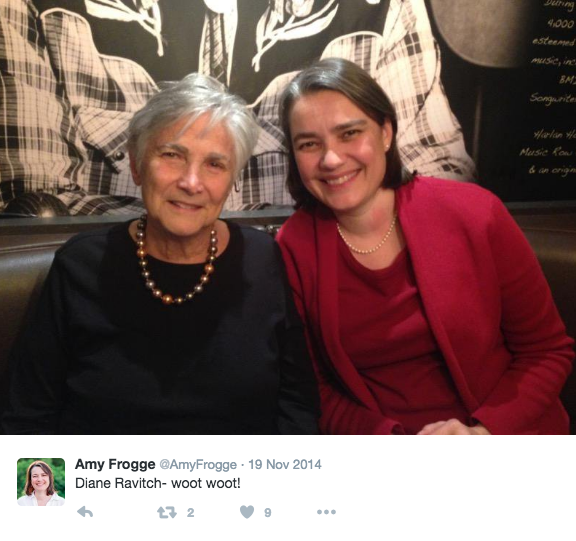 Here is Amy Frogge with Ravitch at an event in Nashville in 2014 that was put on by TREE (Tennesseans Reclaiming Educational Excellence—TC Weber is recording secretary of TREE), an anti-school reform organization. TREE has also put on other events where Pinkston and Frogge have attended. It’s time we ask Pinkston & Frogge if they agree with Ravitch’s call for Joseph’s contract termination. We need to know. Those welcome mats are long gone. I think it’s time to ask our school board members and education leaders if they think Joseph and his staff should be fired three months in. Are these the opinions of extreme bloggers or are these the represented opinions of the anti-reform crowd in Nashville? We need to know. Three months in, are people already starting to work against our Director of Schools? This has happened before…I hope it’s not happening again. I knew this day would come, but I didn’t think it would be so soon into Joseph’s contract when the calls for firing would start up. Nashville came together to hire an amazing new leader, so let’s give him time to show us what he can do. But there is another person who “liked” the Diane Ravitch blog post calling for the termination of Joseph…Dr. Jay Steele. Maybe he is hoping for a second chance to become Director of Schools. 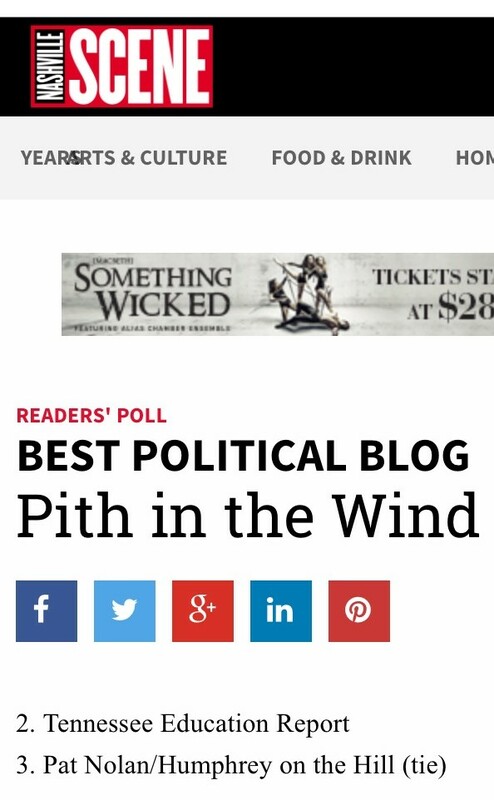 We’d like to the thank the voters in the Nashville Scene Readers’ Poll who selected Tennessee Education Report as #2 in the Best Political Blog category. We’re honored to have earned the respect of readers, having landed in the Top 3 in 2013 and 2014 and earning our highest ranking this year. The state is considerably underestimating the number of educators needed to run Tennessee schools according to its own requirements, says a state comptroller’s report released Wednesday. And local governments are paying the difference. Statewide, districts employ about 12,700 more educators than the state funds, according to the comptroller’s Office of Research and Education Accountability, or OREA. If districts only hired the BEP number of teachers, they could reduce local costs, but they’d also likely have some pretty unhappy parents on their hands. So, yes, the Governor’s proposed changes do direct additional funds to districts. But the changes do not address the underlying problem with the BEP. Doing so would cost another $250 to $300 million. That would be the cost of adjusting the ratios by 10-15% for teachers. That’s not to mention nurses, counselors, and other positions. And it doesn’t include capital funding. The median percentage of additional teachers funded with local money was 22 percent. That translated to 686 more teachers in Knox County and 499 more in Rutherford County in 2014-15. So, what does this mean? It means the state is underfunding local districts by about $394 million. That’s because the updated BEP formula funds teachers at $44,430 per unit. The state pays 70% of this cost. That doesn’t include the cost of insurance for the additional 12,700 teachers. Nor does it include a salary adjustment to begin making up for the teacher wage gap. That cost is about $500 million. So, to add proper state funding for needed teachers and provide adequate salaries, we’d need $894 million. Then, there are the additional priorities identified by the BEP Review Committee. These priorities include providing teachers and schools the resources they need to adequately educate Tennessee’s students. If your local property taxes have gone up recently to cover the cost of schools, you can blame the state for shorting our state’s school districts by nearly $900 million. Incidentally, our state has a $925 million surplus — we could invest every dime of that into schools, meet the current need, and not raise state taxes one cent. Oh, and doing so would both improve public education and keep your local property taxes low. In order to identify the teacher-friendliest states in the U.S., WalletHub’s analysts compared the 50 states and the District of Columbia across two key dimensions, including “Job Opportunity & Competition” and “Academic & Work Environment.” Because competitive salaries and job security are integral to a well-balanced personal and professional life, we assigned a heavier weight to the first category. Tennessee received an overall rating of 33, about in the middle for neighboring states. Our neighbors in Virginia and Kentucky come in at 6th and 15th, respectively, while Mississippi is ranked 47th. Most educators don’t pursue their profession for the money. Despite their critical role in shaping young minds, teachers across the U.S. are shortchanged every year. In fact, education jobs are some of the lowest-paying occupations that require a bachelor’s degree, and their salaries consistently fail to keep up with inflation. Tennessee should aspire to be among the best in our region, and we have the resources to make it happen — including a $925 million surplus for the recently-ended fiscal year. Using this surplus to close the teacher wage gap would improve our rankings and improve the quality of life for teachers. Additionally, the state would do well to heed the priorities outlined by the BEP Review Committee.